The Book of Mormon, Another Testament of Jesus Christ, is an account of God’s dealings with different groups of people who lived on the American continent. The history recounts how the people left Jerusalem, had prophets called of God, and were visited by Jesus Christ. Joseph Smith was given, by the Angel Moroni, a set of gold plates which he translated by the power of God. These gold plates contained the history of an ancient civilization who lived upon the American continent and is called The Book of Mormon. This history begins in 600 B.C. with the record of a man named Nephi, who writes: “I, Nephi, having been born of goodly parents, therefore I was taught somewhat in all the learning of my father; and having seen many afflictions in the course of my days, nevertheless, having been highly favored of the Lord in all my days; yea, having had a great knowledge of the goodness and the mysteries of God, therefore I make a record of my proceedings in my days” (Book of Mormon: 1 Nephi 1:1). In The Book of Mormon Nephi recorded an account of his father, Lehi, who as a prophet of God was commanded to leave Jerusalem with a small group of people and travel to the Americas. The people grew into a great civilization called the Nephites and were taught by men called of God to be prophets. The prophets taught the people the commandments of God, His plan of salvation, and the mission of Jesus Christ. Over 600 years later, Jesus Christ, as a resurrected being, appeared to the people of Nephi on the American continent: “And it came to pass that he stretched forth his hand and spake unto the people, saying: Behold, I am Jesus Christ, whom the prophets testified shall come into the world. And behold, I am the light and the life of the world; and I have drunk out of that bitter cup which the Father hath given me, and have glorified the Father in taking upon me the sins of the world, in the which I have suffered the will of the Father in all things from the beginning” (3 Nephi 11:9-11). In The Book of Mormon we read how Christ taught the people His gospel, organized His church among them, and called twelve disciples to lead the people after His return to Heaven. As disciples these men are also considered prophets, seers, and revelators. Almost 400 years after Christ’s appearance, the Lord commanded a prophet, named Mormon, to make an abridgment of all the records of the prophets of the American continent. Mormon carved his abridgment onto plates made of gold in Reformed Egyptian, and it is he for whom The Book of Mormon is named. The great civilization of people on the American continent became wicked, killed the prophets and all those who would not deny the Christ. There came a great apostasy, or falling away from the truth. The last prophet, Moroni the son of Mormon, was commanded to hide the gold plates in the ground where they laid undisturbed for over a thousand years. Before the plates were buried Moroni wrote a promise to us (Moroni 10:3-5) that if we would read, ponder, and pray about “these things” (The Book of Mormon) that we would know by the power of the Holy Ghost that they are true. Then in 1823 A.D. Moroni, as a resurrected being, appeared to Joseph Smith who was called of God to be a latter-day prophet. Moroni instructed Joseph Smith where to find the gold plates, which Joseph translated and then published in 1830. 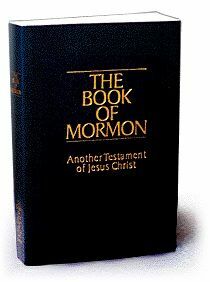 The Book of Mormon also contains the fulness of the gospel of Jesus Christ and is a companion to the Bible. I know The Book of Mormon is true. I have read it, I have prayed about it, and I have received a personal witness through the Holy Ghost, that it is true. I invite you to learn for yourself the truthfulness of The Book of Mormon, Another Testament of Jesus Christ. You can read (or even listen to) the Book of Mormon online or request a free copy (without obligation) to be mailed or delivered to you by representatives of The Church of Jesus Christ of Latter-day Saints.